True Grit is the Coen brothers’ latest hit. Of course, that’s a bit redundant, because generally when the Coen brothers are attached to a film, it’s almost a guaranteed hit. True Grit also happens to be a remake of the 1969 John Wayne film by the same name, and also an adaptation of the book by Charles Portis (the Coen brothers’ version seems a bit closer to the book). 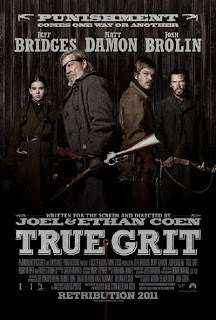 The fact that True Grit is a film by Joel and Ethan Coen and that it is similar to a John Wayne film would have made it an excellent film just on principle. 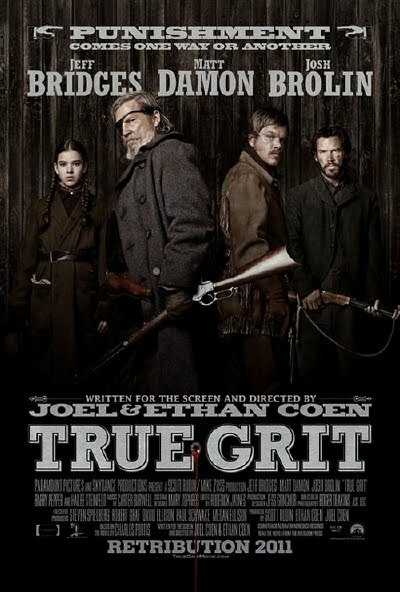 However, True Grit is more than that; it is, by itself, a fantastic movie. It is emotional, humorous, fun, and it has one of the best screenplays I’ve seen all year (the dialogue by itself makes the movie worth the ticket price). True Grit is the story of a fourteen year-old girl named Mattie Ross (played by Hailee Steinfeld, who gives Mattie a perfect combination of tough independence and slight vulnerability) who is on a quest to avenge her father’s death by killing Tom Chaney, the man who shot him. Mattie cannot do this on her own, so she enlists the help of the reluctant Rooster Cogburn (Jeff Bridges), a once-great marshal turned fat old drunk. Bridges plays the part exceptionally, and manages to be on par with, if not surpass, the great John Wayne. Also on the hunt for Chaney is Texas Sheriff LaBoeuf (played by Matt Damon, whose presence singlehandedly makes the movie a hundred times better, even when he’s not speaking. That man is perfect; he could have made Howard the Duck a great movie), who accompanies Mattie and Cogburn on the manhunt. Cogburn and LaBoeuf have some terrific banter, but end up working together for the sake of Mattie. Whether intentional or not, I picked up a sort of temporary dysfunctional family vibe mixed in with all the exhilarating western action and suspense. When Mattie stumbles upon Chaney, the movie hits its climax and doesn’t let up on the action for quite some time. My only complaint would be that Chaney (portrayed by Josh Brolin) was mainly just an evil drunk, like a Rooster Cogburn gone bad, and typically I enjoy a little more menace and depth in a western villain. Regardless, the film is fantastic from start to finish. In addition, the western scenery and overall cinematography is stunning; it’s one element that I think surpasses the original True Grit, though both movies, in their own ways, are excellent. Approaching Oscar season, I can see True Grit garnering quite a few nominations. With ten best picture nominees, I expect to see it in that category, though I doubt it will be victorious, especially against surefire Oscar darlings like The King’s Speech. It’s an excellent film that deserves to be seen in theaters instead of something like Transformers #34 or whatever sequel they happen to be on; I saw a trailer for Transformers on the moon, and it made me a bit more wary of a pop-culture apocalypse. All in all, though, True Grit shines, and it’s among the best in this crazy year, where movies were either simply wonderful or simply terrible. True Grit is definitely one to see before Oscar night.